This past April a team of British bicycle riders embarked on a cross-country trek, pedaling out of Portland, Oregon towards their final destination, Portland Place London. The cyclists, all involved in the architecture, property, and planning industry, embarked on this incredibly long journey, which involves pedaling across the United States and then from Ireland to the UK, to study the way that cities are adapting to people’s growing tendency to choose the bicycle as their primary mode of transportation. 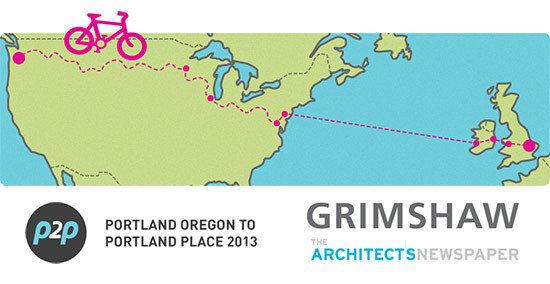 On July 2, 2013 Grimshaw Architects, a sponsor of P2P along with The Architect’s Newspaper, invites you to the P2P Welcome Reception where they will celebrate with UK architect and journalist Peter Murray and his P2P team in New York City as they conclude the first part of their cycling adventure, the 4,089-mile-long US leg of their bike ride. Their 4,347 mile voyage will be come to an end in July 2013 after they complete the final 258 mile bike ride across the UK and London. The festivities will take place at Grimshaw’s New York office at 637 West 27th Street.